Have you checked your employees’ Fitbit logs lately? 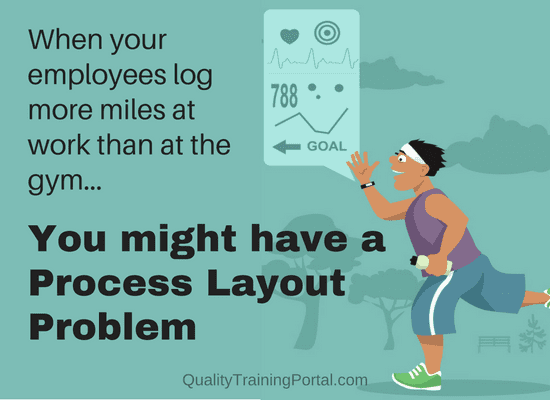 If your employees are hitting their daily step goals just by doing their job, it could be time to take a look at your process layouts. A Lean Process Layout is one that minimizes the travel of product, raw material inputs and the workers in the process. A great place to start, if you want to understand your existing process workflow, is to have the person or the people who work in the process walk you through it, as if you are the product being made. 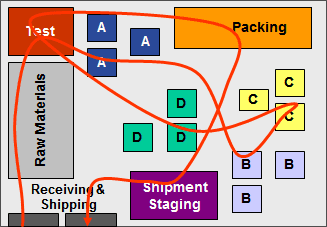 Record travel through the process on a workflow diagram. Be diligent about following the process exactly as it unfolds; don’t skip past a step because it is inconveniently located outside of the rest of the workflow. Following the exact workflow is the only way to get an accurate picture of the true process – warts and all. The workflow diagram is sometimes referred to as a spaghetti diagram because of the way the “before” picture looks. While simplified, this diagram shows an actual process before improving the process workflow layout. Clearly there was a lot of movement between processing and testing, packing and shipment staging. By lining up process steps next to each other and bringing the packing step to the end of the process along with a satellite testing area, there is a lot less wasted movement and, as a bonus, there is now room future expansion. Workflow is a cornerstone of Lean Manufacturing since unnecessary travel of a product through the process is waste. While the workflow diagram can give a quick overview of process flow, it likely doesn’t provide a complete picture of the complexities of the process steps, staffing, raw materials, building limitations, equipment utilization and customer demands. Data is required to have the necessary comprehensive understanding of the operation. The goal of a Lean Process Flow is to arrange process steps in a natural flow order linking process steps to minimize cycle time and travel distance, eliminate crossover points, and simulate a continuous flow process by putting internal customers and suppliers next to each other. In a perfect world, you would simply pick the flow that seems most efficient for your product line. But changing a workflow in an existing facility can be a challenge. You have to factor in constraints with the physical site such as building entry and exit points, building height and floor load limits and “monuments” such as structural features of the building and pieces of equipment that cannot or should not be moved. Utilities, facility support and access further influence the flow as do other important process flow considerations. For example, will you have dedicated lines vs. product families run on the same lines? What impact will shared equipment and other resources have on the final layout? Couple your understanding of the constraints of the existing flow with process data with a solid understanding of important layout considerations and then design a Macro Workflow. This will give you a high-level view of the improved process layout, Micro Workflow details can then be worked out. These details include balancing process lines, incorporating kanbans, simplifying material handling and organizing workstations. Get it right and a Lean Process Layout will reduce resources, lower costs, slash production times and even create a safer work environment. But, be aware of the consequences. If employees are counting on their jobs to rack up Fitbit exercise badges, you may need to include a health club membership in their benefits package. Use a Workflow Diagram to get a quick overview of the existing process. If it looks like a plate of spaghetti, there is room for improvement. Use data to get a comprehensive understanding of the existing operation. 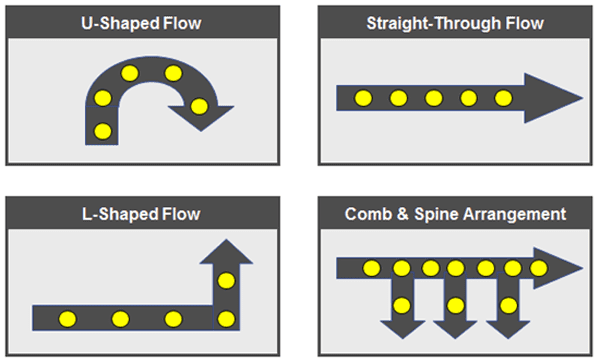 Arrange process steps in a natural flow, to minimize cycle time and travel distance, eliminate crossover points and simulate continuous flow. Put process “customers” and “suppliers” next to each other. Work first to design a Macro Workflow and then work on the Micro Workflows to fine-tune the new processes.